The mold in Dr. Florey's coat: the story of the penicillin miracle. · One Book. One Author. One Hour. The mold in Dr. Florey's coat: the story of the penicillin miracle. 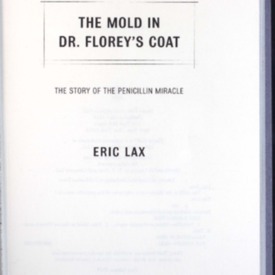 Lax, Eric, “The mold in Dr. Florey's coat: the story of the penicillin miracle.,” One Book. One Author. One Hour., accessed April 24, 2019, http://booknotes.gmu.edu/items/show/666. The account of Alexander Fleming's discovery of penicillin in his London laboratory in 1928 and its eventual development as the first antibiotic by a team at Oxford University headed by Howard Florey and Ernst Chain. "Florey, Howard, Baron Florey, 1898-1968."